Teich Toys is located in the heart of the west village in NYC. The store’s beautiful design and an incredible selection of children’s toys and books have caught my attention quite some time ago. 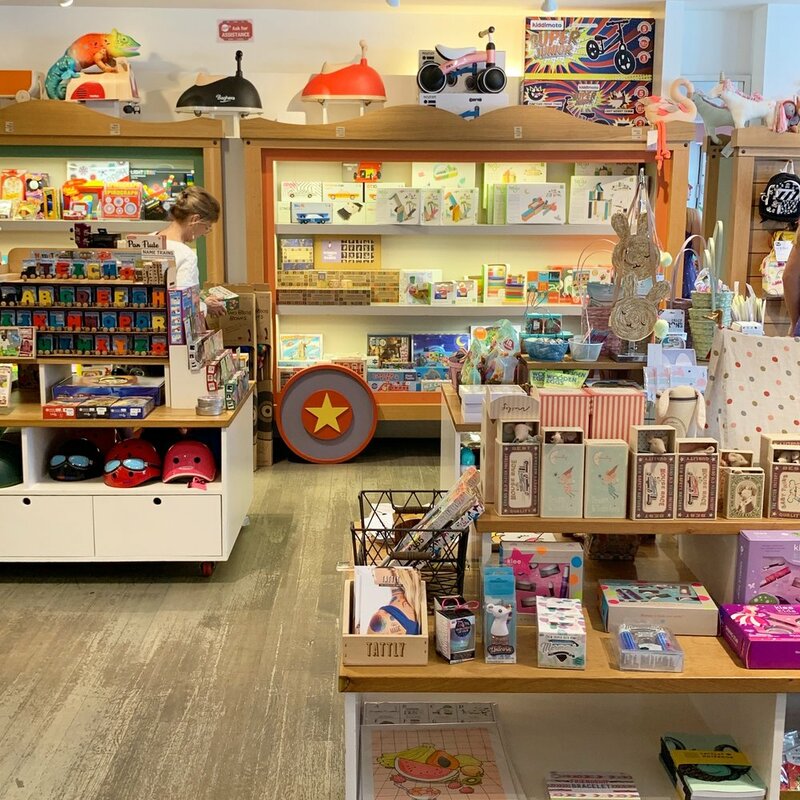 When I decided to add toy store tours to my blog, I knew I wanted to feature Teich toys, so I got in touch with Allison, the owner who was kind enough to provide some background info about how the store got started and how she selects her toys. Read all about it in my interview with Allison below. 1) When did the store first open? 2) What gave you the idea? I had a small gift store nearby on 8th Ave that sold gifts and accessories (for grown-ups) with a small area with toys and gifts for kids. That area became very popular and the feedback was always positive. Since I’m also a mom who lives is the neighborhood, I agreed with my customers that there was a need for a toy store. What really sealed the deal was when the perfect retail space became available: on a nice stretch of Hudson Street, lots of window frontage, and across the street from Bleecker Street Playground. 3) Your store has a beautiful design. How did you come up with it? We were inspired by the shape and layout of the store. My mother had the idea to build a life size wooden toy train that would wrap around the interior of the store. She envisioned the train engine protruding into the store, which would also serve as a place for kids to sit and play while parents shopped. The shelves already existed from the previous tenants so we built train car frames around them to make it appear like the shelves were inside the train cars. We hired a talented up-and-coming architecture firm, Hunt Architects, who took our vision to a new level. 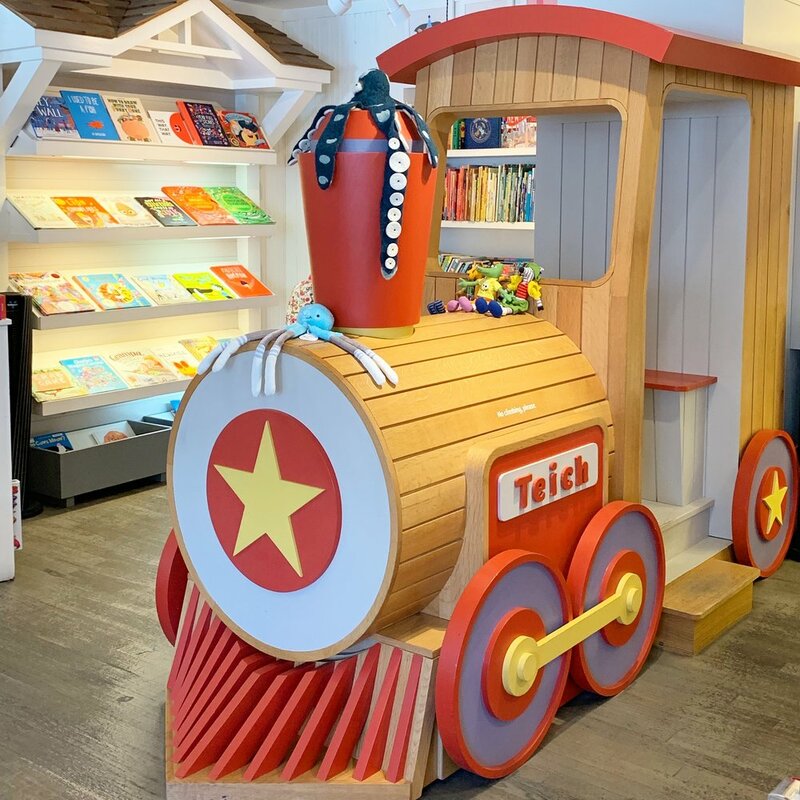 They worked with 2 teams of local craftspeople to build the train, the train depot (our book and reading nook), the cash wrap, and the movable merchandise tables that fill the store. We wanted it to feel open and not over-crowded. 4) You have an incredible selection of the best children's toys. How do you select the toys? Thank you! Our toys come from all over. Some are independent designers and craftspeople who I find though the internet and social media, word of mouth, or who contact us. Often our customers recommend stuff they really like. We carry a bunch of things made by neighborhood moms, like bracelets, hair accessories and cards. I attend a few big trade shows throughout the year where I stock up on some of the more well known brands. I do try and stick to brands you won’t find everywhere, and that are more special. Quality is also very important to me. I look for toys that will be treasured, and that will last a long time. I also focus on things that will keep kids occupied and away from screens, such as DIY kits, science experiments, puzzles, board games and art supplies. 5) Do you sell online? 6) Do you do any events? We host a story time every Tues at 11:30. We do hold other events and initiates thought the year. This coming week we're hosting an Earth Day recycled toy drive for Second Chance Toys. People can clean out the old toys that their kids no longer play with, and they will be distributed by the organization to kids in need. We always do something fun here for Halloween and Pride (big holidays here in the West Village:). Visiting Teich toys is always a lot of fun as I tend to discover new and interesting products. Here are a few toys from my last trip that caught my eye (that I think you will love as well). 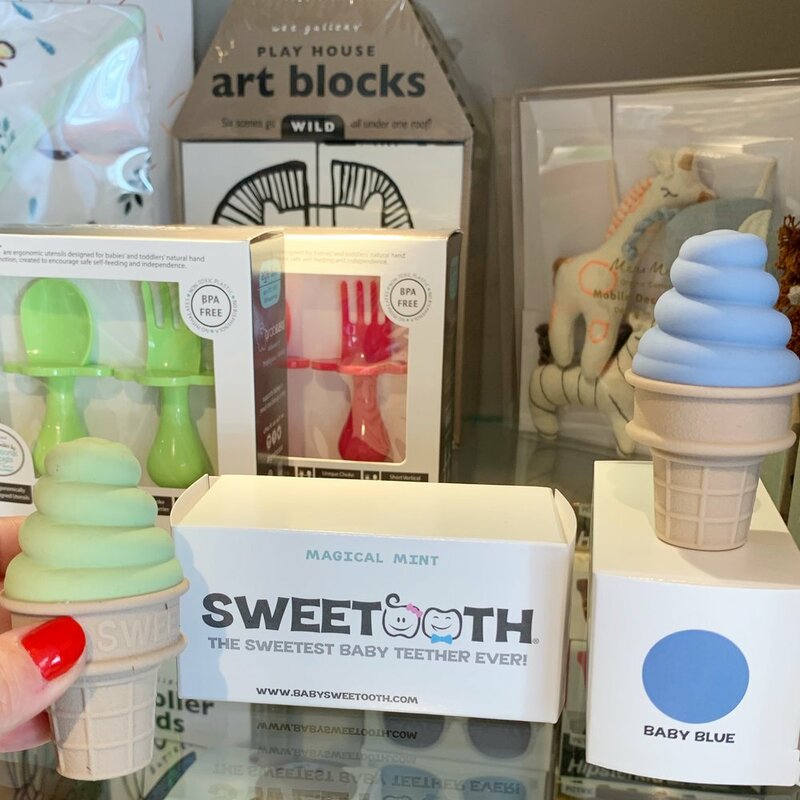 Sweet Tooth is the cutest sweetly scented baby teether. The shape of the cone is easy for a baby to grasp and hold, and the different surfaces allow for exploration of different textures. Sweet Tooth would make a great baby shower gift or Easter Basket stuffer. These Paper Dolls are artists and musicians that come with a Tri-fold studio where they work and play. They also include two sheets of reusable clothes and accessories to inspire imaginative play and creativity. 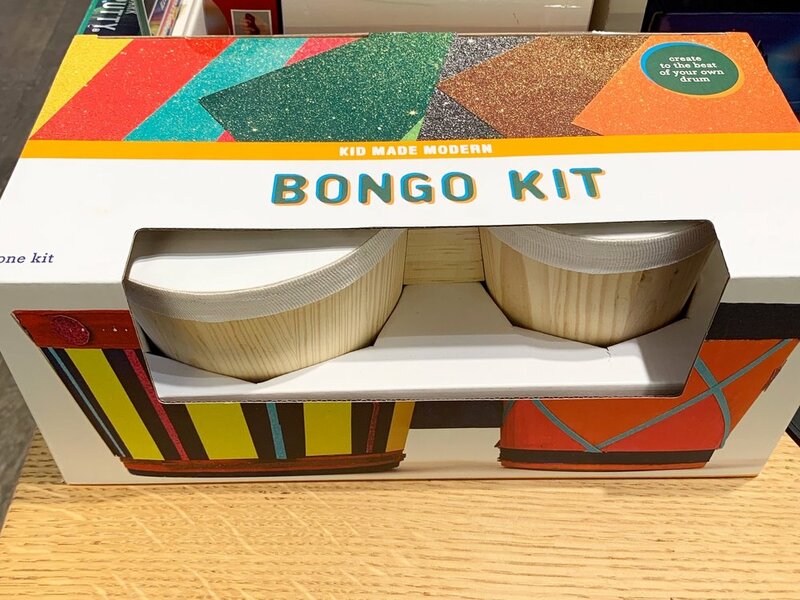 I was immediately drawn to this Bongo Kit because it’s a craft activity and musical instrument in one. The set comes with drums and decorative accessories for kids to personalize their own instruments. How cool?! There were of course many more amazing toys, check out Teichtoys.com to see them or stop by the store if you’re ever in NYC.